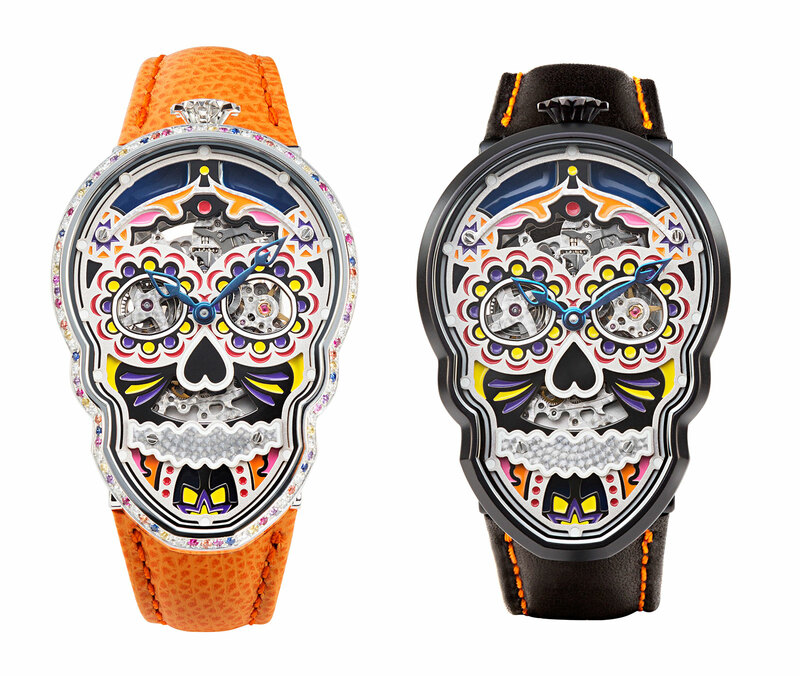 A pair of skull-shaped wristwatches with hand-lacquered dials in bright colours. 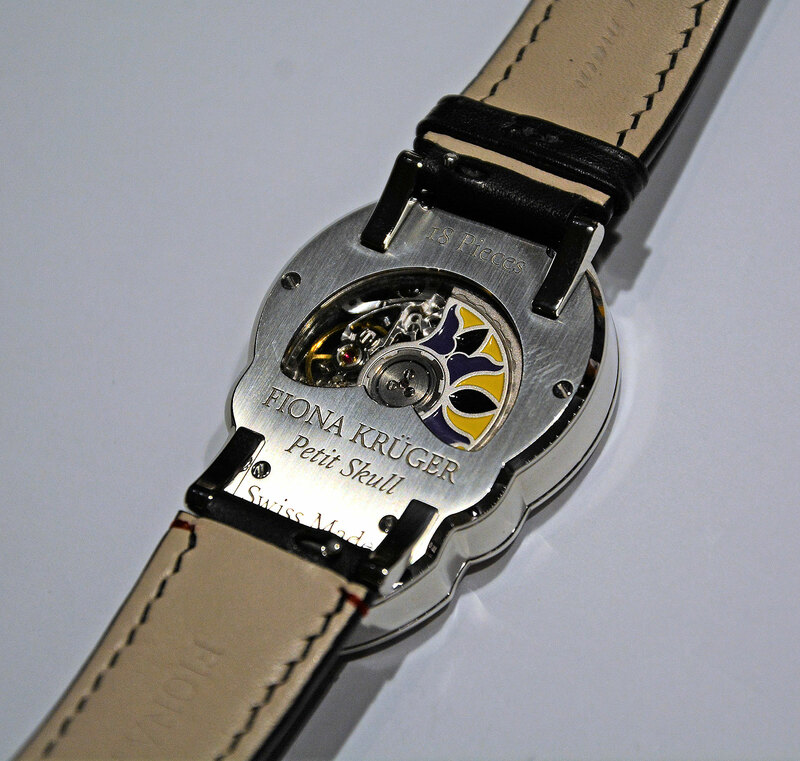 Fiona Krüger started her brand in 2013 with a skull-shaped watch, which has since become her signature theme. 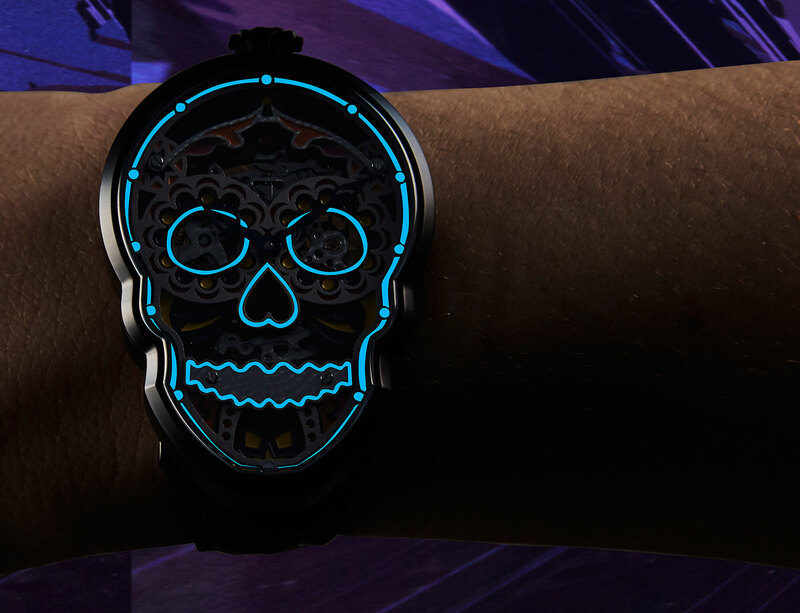 Inspired by Dia de los Muertos, or “Day of the Dead”, a Mexican festival that honours the dead, the wristwatch began as a project for Krüger’s postgraduate degree in luxury and design at Swiss design college ECAL. Since then Krüger has introduced several different variations on the theme, but all revolving around the distinctive skull-cased case, including the latest additions to the line: the Eternity and Enigma. Announced at Baselworld 2017, the pair are part of the Petit Skull collection, the smaller of the two case sizes offered by Fiona Krüger. The Eternity has a polished stainless steel case set with seven types of coloured gemstones, including diamonds and rubies, with each colour represents a day of the week, while the Enigma case is coated matte black. The Petit Skull case is still rather big, measuring 48mm long and 34mm wide, so it appears quite large on the wrist. But a height of 9.8mm as well as the skeletonized dial helps it feel slightly more delicate. Despite the apparent size, the Skull sits on the wrist comfortably. Thanks to the lugs that are on the edge of the case back, the Petit Skull wears like a conventional watch watches. Nevertheless, the case form needs a bit of getting used to it. Both the Eternity and Enigma share the same dial, made up of several layers. The primary layer is a polished base plate that’s PVD coated and hand-lacquered in bright colours. Over it are elements that ornament the skull, like the eyebrows. And the teeth of the skull along with the perlage-decorated “mouth” are a separate plate. Through the eyes of the skull, the balance wheel and the main spring can be seen. 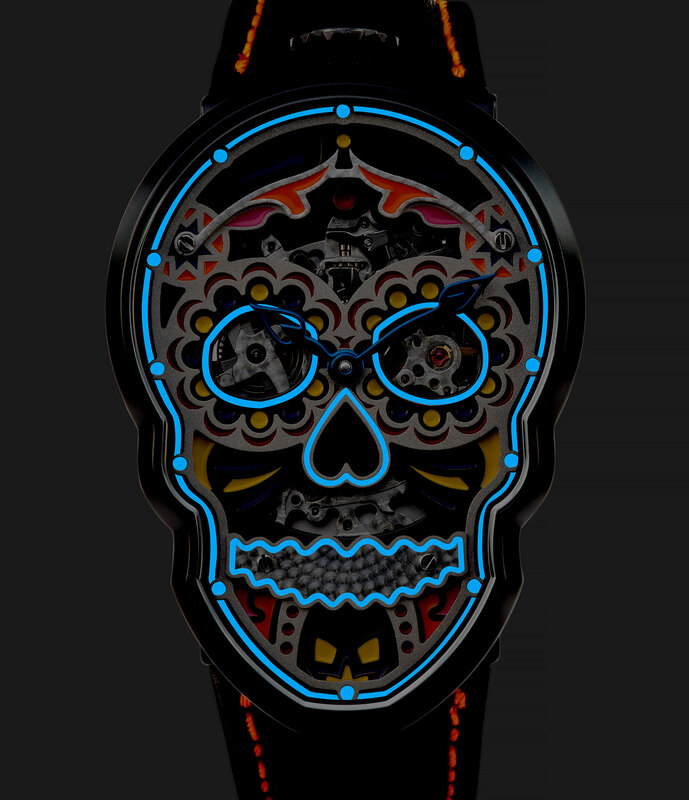 The dial is painted with Super-Luminova to ensure the legibility of the hands and indices as well as creating an outline of the skull in the dark. Partially visible through the sapphire crystal back that reveals the hand-painted rotor, the movement inside both the Eternity and Enigma is the Soprod A10, a time-only automatic. 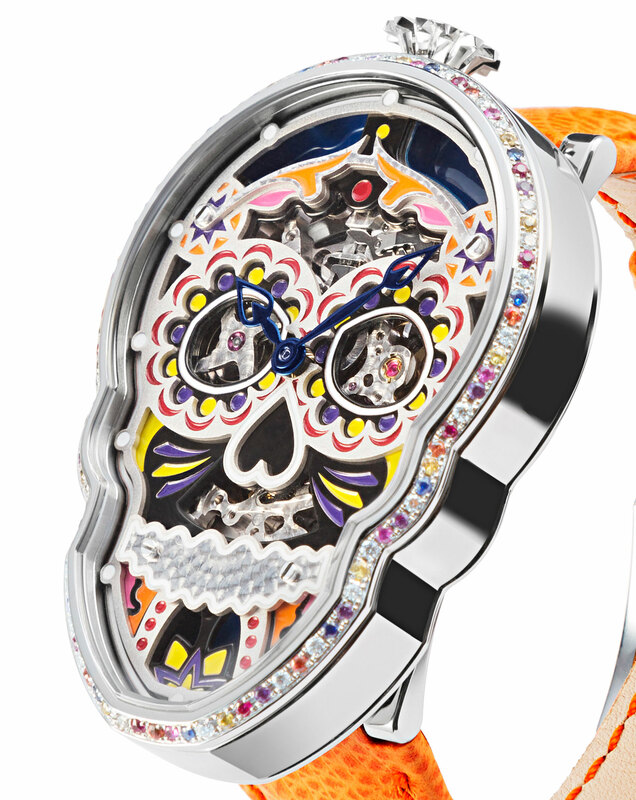 The Fiona Krüger Petit Skull Celebration watches are limited to 18 pieces each, priced at SFr22,500.